This drawing is of one of the elaborately carved pillars of the Tirumala's choultry, a rectangular hall set outside of the east gopura (entrance tower) of the Minakshi Sundareshvara Temple. The Temple is dedicated to Shiva and his consort Minakshi, an ancient local divinity. The construction of this imposing temple-town was made possible by the wealth and power of Tirumala Nayak (1623-1659). He was the most prolific builder of a long line of Nayaka kings, a dynasty who ruled a large portion of Tamil country in the 16th and 17th centuries. The rectangular precinct covers 6 hectares and has 11 huge towers and 4 entrance gopuras. Inside this enclosure there are columned mandapas, tanks, shrines and the two temples of Shiva and Minakshi. The temple is profusely ornamented with sculpture and paintings and contains a number of valuable jewels. 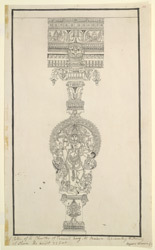 This drawing depicts a pillar from the temple, elaborately carved in the shape of Shiva Nataraja, Lord of the Dance, which symbolises the cosmic process of the world's destruction and creation.